In a bowl mix flour, sugar yeast, gradually pour warm milk. Mix it well, cover and put in a warm place for 10min. Take 2 cups of sifted flour, sugar, cinnamon, salt, vanilla,butter and mix in a food processor to get small crumbs. Add egg, lemon peel and brew, Mix the dough well and add half of the glass of sifted flour. 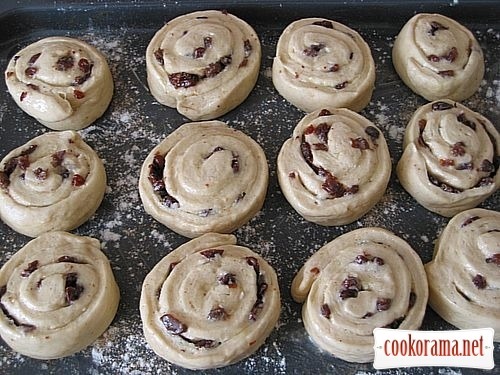 Then put dough on a powdered with flour table, if it is sticky add more flour. Knead dough for two minutes, till it become smooth. Then form a ball, put it in a greased with oil bowl. 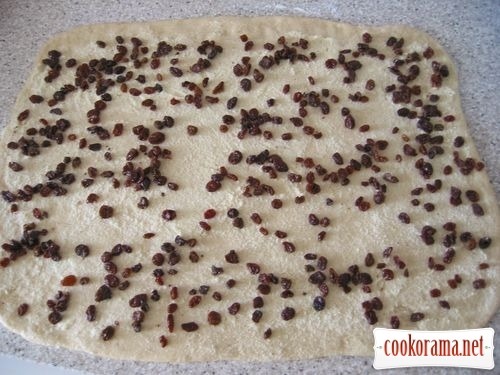 Cover it and put in a warm place for 1 hour, dough should rises twice in size. Mix 60 g of butter with sugar well. Cover the pan with a baking paper. The rised dough put on a powdered with flour table, knead it a little. Then roll a sheet, grease with butter. Put some dry fruits on the top, stepping back slightly from a wide edge. Carefully make a roll, seam down, cut into 12 pieces. Shift them on the pan, slightly flattened buns with hands. Cover them with foil and leave till oven is heated at 210℃ (gas at 190). Then put them in the oven (you can grease them with egg) and bake till golden brown for 20min. Leave ready buns to cool off. Meanwhile mix milk and sugar, heat it and stirring wait to boil. Remove from the heat, and cover buns with glaze. 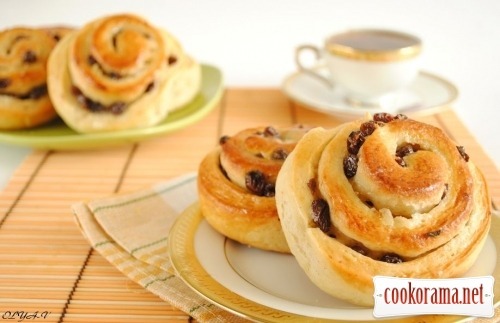 Top of recipe "Buns "Chelsea""